If you got a new laptop then maybe it only has USB C ports and if that is the case then how do you connect all your “old” USB devices? AUKEY got you covered with this 7 port USB 3.0 hub that comes with a USB C cable so that you can connect it to your new computer and then you can connect up to 7 normal USB devices to it. And this AUKEY hub comes even with a power adapter just in case you need to for some power hungry devices. The round shaped USB hub also has different colored edges so that you can make it look a bit more fun and playful. 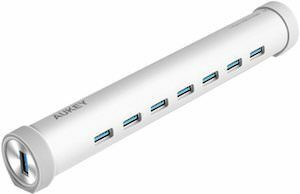 Come check out this AUKEY USB C 7 Port USB 3.0 Hub.